This is a ‘cassette’ style unit in that the hatch framing, door & ladder are all part of the same item. The opening in the ceiling will need to be framed out at approximately 1110mm x 550mm. And a timber architrave fitted after the ladder is in place. The unit requires no stowage space outside the area of the hatch as the ladder stows on top of the hatch door. The weight rating is 160 kg (25 stone) and the treads are flat and approximately 80mm wide. The door is insulated and finished in matt white. This style of ladder has a 2.8m maximum floor-to-ceiling height. The operation of the door is aided by heavy-duty springs which ease the door down and help to pull it closed. 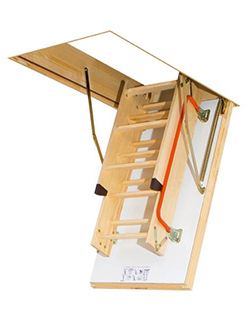 Once the door is opened the ladder folds out, requiring approximately 1.53m of clearance from the hinge point of the door.